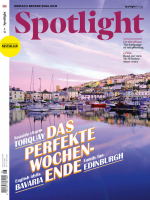 Besuchen Sie mit unserem beliebten Kolumnisten Colin Beaven Torquay an der englischen Riviera. Genießen Sie prachtvolle Häuser, hervorragenden Tee und ein wenig Klaviergeklimper in Agatha Christies Villa. Day 1 — 9 a.m.
First things first: I’m here in Torquay, in south Devon, so I need to see the sea. I go straight to the seafrontMeeresuferseafront. The bay, with Brixham on the other side, is lovely, a feastFestschmausfeast for the eyes. And it has the perfect sauce to go with it: a nice breath of sea air. No wonder the houses have huge windows to catch the wonderful views. Buffalo Bill was impressed: “It is the prettiest place I have seen in my life” was his reaction when he passed through Torquay in 1904. The Wild West showmanSchaustellershowman is one of many big names to have visited. And Agatha Christie was born here. The Agatha Christie Mile, from the Imperial Hotel to the Grand Hotel, leads you to places that are linked to her. She to honeymoonauf Hochzeitsreise gehenhoneymooned with her first husband at the Grand. Sadly, the beautiful art nouveau Pavilion Theatre, where he proposed to her in 1913, is closed and fighting redevelopmentSanierung, Neugestaltungredevelopment. To celebrate the queen of crime’s favourite instrument of murder, the gardens at Torre abbeyKloster, AbteiAbbey have a collection of poisonous plants. This medievalmittelalterlichmedieval building, right in the town centre and just steps from the sea, became a family home in the 16th century. It has a confusing number of staircaseTreppe, Treppenaufgangstaircases — useful, perhaps, since the Carys, who lived here, were Roman Catholics. Not until 1791 was it legal for them to to worshipeine Religion ausüben, betenworship openly. Even their lovely 18th-century wine glasses, with their Catholic symbols, were treasonousverräterischtreasonous. They may have felt they could never have too many staircases. The abbey is now a museum, with clever digital exhibitAustellungsstückexhibits like dinner plates that talk to each other. They bring to life the elegant dinner parties that took place in these rooms in Georgian days. One of the guests the Carys welcomed here was Admiral Nelson. Talking of food, I go to the Elephant, where the lunch is truly excellent, and not too extravagant. It’s on the other side of the marina, just past the house where Elizabeth Barrett Browning lived. Her best-known poems are her love sonnets. So you see, Agatha is not the only famous woman writer who lived in Torquay. Cockington is only a mile or so from the town centre — but what a contrast! With its charming cottages, it’s a village in the country; and Cockington Court, with its majestic trees and park, is a lovely place to walk. Access is free, and behind the big house, there are workshops where I enjoy looking at decorative mosaics, wrought ironSchmiedeeisenwrought iron and glass. Cups of tea are on hand in the cafe, and also at tea shops in the village. It’s temptingverlockendtempting to stop in at a few of them on my way back to the Villa Marina, the guest house where I’m staying. Day 2 — 8.35 a.m.
There’s lovely soothingberuhigendsoothing music on the radio — a tuneLied, Melodietune by Borodin: the one that was borrowed in a song called “Stranger in Paradise”. What a fine start to the day. My plan is to walk a bit on the coastal footpathKüstenwanderwegcoastal footpath, and a good place to join it is at the Imperial Hotel, familiar to both Miss Marple and Poirot. From there, I pass Daddyhole Cove and Thatcher Rock. By the time I’ve reached Hope’s Nose, the sea stretches in all directions, with views of Torbay to the south and Lyme to the north. I had toyed with the idea of bringing a picnic and going on to Anstey’s Cove, but I decide to go straight to Kents Cavern in time to have lunch in their cafe — and a bit of a rest really. The caveHöhlecaves at Kents Cavern are extraordinary. reassuringlyberuhigenderweiseReassuringly, you have to take a tour — they already have enough skeletons in their collections, so they don’t want you getting lost. The rocks here are 385 million years old. Rocks in south Devon to datestammendate from the Devonian period, and there aren’t many places that have named their own sliceStück, Teil, Abschnittslice of geological history. Will Hollywood ever make a film called Devonian Park? Probably not. It wouldn’t have any dinosaurs, just coralKorallecorals and primitive fish. Will Hollywood ever make a film called Devonian Park? The caves have offered up many treasureSchatztreasures. I’m shown a tool that’s 600,000 years old, as well as the skullSchädelskull of a bear, which I am told is 420,000 years old. In the 19th century, when excavationAusgrabungexcavations here revealed bones of woolly mammothMammutmammoths as well as tools left by humans, it became even clearer that Bible-based history needed a rethink. Not surprisingly, Charles Darwin wasn’t far away. He spent six weeks down the road at Hesketh Crescent, a fine address with charming sea views, where you’ll now find the Osborne Hotel. But Darwin and his wife were on holiday. And anyway, he was too busy studying orchidOrchideeorchids to pay much attention to caves. From the caves, it’s a short walk to Babbacombe, where there are plenty of clifftopFelsvorsprungclifftop benches with views out to sea. To my right is the house where Oscar Wilde spent the winter of 1892. To my left is the cliff railway. I can’t resist a ride on the railway. It dates from 1926 and looks like a mechanical kangaroo. It leads down to Oddicombe Beach, which isn’t big, but it’s red. Much of the earth here in Devon is red, as are the cliffs and the sand at Oddicombe. It’s like spending a holiday on Mars. Unlike Matt Damon in The Martian, though, I find it easy to get home. There’s a bus back to Torquay. Day 3 — 8 a.m.
Today’s tune on the radio during breakfast is the “Hallelujah Chorus”. Usually, one stands up when this part of Handel’s Messiah is performed. Torquay seems to be a traditional place, but standing while you have breakfast might be overdoübertreibenoverdoing things. I look round to check. All the guests have remained seated. The world is clearly changing. The time has come to pay serious homageHommagehomage to Agatha Christie. Today’s trip is a visit to Greenway. Bought as a holiday home, Greenway stands not by the sea, but high above the River Dart, with beautiful views in all directions. It’s worth climbing to the top of the garden, from where the river looks spectacular. There are some lovely camelliaKameliecamellias — which I can at least identify. As I walk down to the riverbankFlussuferriverbank, I notice that many trees have labels with names in Latin. Be warned: the boathouse is the scene of a murder. It occurs in Dead Man’s Folly. Close by stands a gun batteryGeschützbatteriegun battery left from the war — another murder, this time in Five Little Pigs. You really have to to pick one’s way through sth.sich zurechtfindenpick your way through the fictional bodies. A visit to Greenway takes a bit of planning. Parking spaces have to be booked, but you can also get there by steam trainDampfzugsteam train from Paignton. You get off at Churston, where a special old bus will transfer you directly to the house. But there’s no bus on Fridays, so you ask the train to stop at Greenway Halt. It’s a 30-minute climb from there. Alternatively, take the ferry from Dartmouth. Ideally, you need Hercule Poirot and his little grey cells to help organize this, till he gives up and just hands the case to Miss Marple. There’s no shortageMangel, Knappheitshortage of Agatha Christie’s belongingsHabseligkeitenbelongings in the house. She and her husband were collectors, and their possessions are everywhere. “If she were to come back now,” one of the room guides tells me, “she’d say it was more or less as she’d left it, but that we’ve tidied up a bit.” Agatha, you’re like me. You need to to declutterentrümpelndeclutter. There are plenty of personal items, too: first editions of her books, her typewriterSchreibmaschinetypewriter, the dollPuppedoll that also appears in her portrait, painted when she was little. And then there’s her piano. It spent the war in her London home, and a bomb exploded close by. The piano never sounded the same again, she said. Perhaps that’s why visitors are allowed to play it. Of course I have a go at playing Agatha Christie’s piano. It’s a highlight of the trip. On the way back to Torquay, I pass through Paignton, and it’s tempting to go to the sea and the old pier, only five minutes from the station. But I choose Oldway Mansion instead. It’s enormous, built in the classical style as a house for the Singer family, who made their money from sewing machineNähmaschinesewing machines. Paris Singer brought his mistressGeliebtemistress here, the famous Isadora Duncan — a dancer, not a singer. The house is in a sorry state and closed, but you can still use the park and the gardens, as the teenagers do who go there every day to smoke and ride bikes. “My mum and dad got married here,” one tells me. Wow! Imagine sweeping down Oldway’s fabulous marbleMarmormarble staircase in your wedding outfit, and behind you, Jacques-Louis David’s picture of Napoleon and Josephine being crowned. Yes, the painting did hang here, but it was sold to France after the war. It’s now in Versailles. It is itself a replica that David had made of the original, which is on show in the Louvre. So Mum and Dad had to to make do with sth.mit etw. vorliebnehmenmake do with the colour reproduction that filled the gap once the painting had been sold. Still, what a venueSchauplatzvenue! Day 4 — 9 a.m.
Today, I’m off to Brixham, where the top attraction is fresh fish — or should that be “quay(Wortspiel: klingt wie “key” (Haupt-)) Kaiquay” attraction? The boat gets across the bay from Torquay in 30 minutes, letting you land in the style of William of Orange. William arrived here in 1688, and then took his army to London. Once James II was finally out of the way, William shared the throne with his wife, Mary. The following year, Parliament to passverabschiedenpassed the Bill of Rights, so Brixham played a key part in the “Glorious Revolution”. It had another famous visitor in 1815. unlikeim Unterschied zuUnlike William, this one didn’t land. He arrived on the HMS Bellerophon, and was guarded to make sure he stayed there. As one of the sailors reported in a letter to his family, “I have news that will to astonish one's bowels (hist. )einen bis ins Innerste erstaunenastonish your bowels”. Napoleon was on board, following the Battle of Waterloo. And the poor man wasn’t even allowed on land for a beer or some fish and chips. Fish and chips: I’m tempted to eat some in the open air, but I hear seagulls. After battles in the past over sandwiches and ice creams, I to opt for sth.etw. wählenopt for lunch indoors. The Rockfish restaurant is right next to the new fish market, so the fish won’t get much fresher than there. Lunch inspires a limerick. It’s no rival to an Elizabeth Barrett Browning love sonnet, but it provides a useful warning: “When a tourist buys ice creams in Brixham; He/she to strollschlendern, bummelnstrolls on the pavement (UK)Bürgersteig, Gehwegpavement and licks ’em; But, good tourist, beware!Vorsicht!beware! Note the menacingdrohendmenacing stare; Of the bloody (UK, ifml. )verfluchtbloody great seagull that to nick (UK, ifml. )stehlennicks ’em.” To be fair, it wasn’t Devon where I had to defend my ice cream. It was next door in Cornwall. But don’t forget. Seagulls can fly. My final visit is to Coleton Fishacre, the house that belonged to the D’Oyly Carte family. They made their money from hotels like the Savoy in London, but also from theatre. The Savoy Theatre was home to comic operas written by Gilbert and Sullivan and staged by “Mr D’Oyly Carte’s Opera Company”. The operas are fun, silly, cheeky (UK)frechcheeky, satirical about Victorian England and tunefulmelodischtuneful. Why some people are snooty (ifml. )hochnäsig, abfälligsnooty about them beats me (ifml. )ist mir schleierhaftbeats me. The D’Oyly Cartes built their seaside home just south of Brixham in 1926. It’s a lovely blendVerschmelzungblend of art deco elegance, luxury and comfort, but it’s a long walk from the nearest bus stop. It’s easiest to get there by car, unlesses sei denn, außerunless you want to arrive exhaustederschöpftexhausted via the coastal path, and to crawl uphochkriechencrawl up through the garden past exotic tree fernFarnferns and fuchsias the size of apple trees. There are serious walkers on that footpath, and they’re rewarded by spectacular views. “We did the whole South West Coast Path,” one tells me. “It took us ten years.” I panic — until I realize they did it in stages, not all at once. Back in the house, you see a postcard written by a family friend, Major George Llewellyn. He was inviting his girlfriend to come and stay; her rather unusual name was Loveday Bolitho. “It is quite different to West Cornwall,” he wrote, “but very beautiful.” His words echo as I pack up and leave. Fly to London, then drive or take the train to Torquay. Mehr Informationen: Südengland – Faszination der grünen Küste!